Photograph by multicamera director Sue Robinson, no reproduction without permission. The photo is of the Gallery for Studio A, which was Pebble Mill’s largest television studio, used for dramas as well as entertainment shows, like ‘Pebble Mill’, ‘Going for a Song’, and ‘Call My Bluff’ . 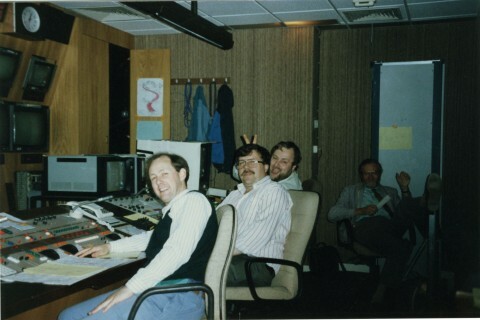 Included are (left to right): Keith Knowles (vision engineer); Dave Bushell (lighting director); Pete Eggleston (vision engineer); Pete Hodges (vision supervisor).